Art journal peek time again. Here you go, a really fat mail dove flying in, landing on my page and going about his business. Not considering much, as doves often do. I love the mix that my art journal pages are, but sometimes I wish they were a bit “cleaner”. And what I mean by that is that I sometimes wish one journal was only my work: my doodles, sketches and drawings – no images pasted in from other sources, no collaged images, postcards or other influences. Though every time I start a new journal I “mix it up” again. Mixed media is fun, and the no rule-approach where everything creative is allowed have saved me from abandoning many a book. Am I longing for something more like a “real sketchbook” all of a sudden? I’m not sure just yet, but I think the next notebook I bind myself I will try only using plain white paper in, instead of mixing it up with calendar pages with other’s images and envelopes where I usually end up making collages. Maybe it will become something else, a new (to me) kind of Art Journal? What works best for you? Do you have separate books for separate things and working in multiple books at the same time? 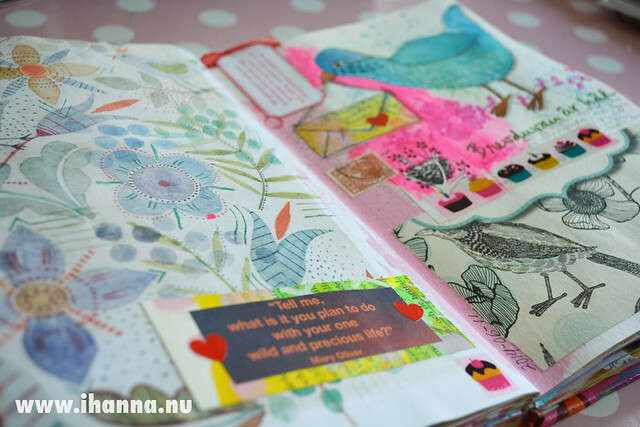 Or do you make “my kind” of Art Journal Pages where everything fits in? 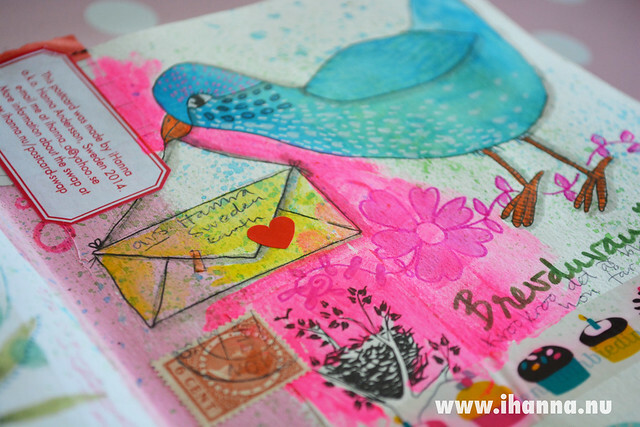 This entry was posted in Art journaling and tagged art journal peek, watercolours. Bookmark the permalink. Love this post! Starting with the quote by Joseph Campbell that knocked my socks off and going from there, I feel inspired. I love your collaged pages. Frankly I like this better than the traditional sketchbook. That’s funny because I usually gesso a page and add layer and layer of paint, but seldom paste much down. I mean to…really I do. Looking at the collages of others I feel a longing, yet I go back to my paints and stencils and found objects for mark making. Still, trying something different has its merits. Can’t wait to see what you decide. Thank you so much Lynda, Campbell had a lot of smart things to say. I doubt I will be making a traditional “sketchbook” you know, with fancy city outlines because I don’t enjoy that kind of sketching. I was more thinking of more paints and drawings jumbled together, but we’ll see. I hope you can get more collage into your journal too, it’s super fun – it’s my favorite and I will keep doing that too for sure. I like the mix. It stops you getting blocked and stops your work becoming tired and stale. It mixes it up! Hi Ali, long time no see! You’re right, mixing it up helps moving it forward. I hope all is good with you!? 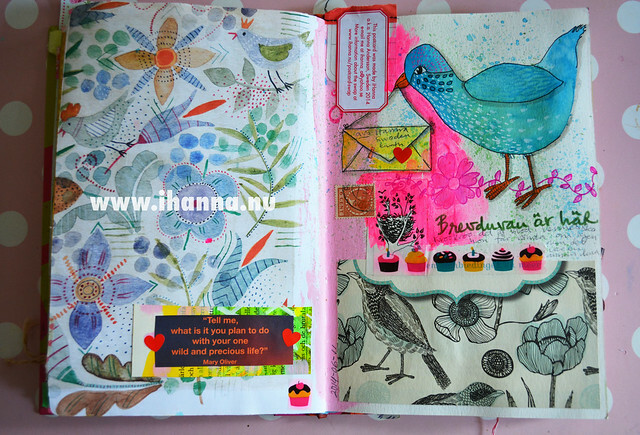 I totally love your mixed pages, Hanna and seeing your journal pages always inspires me. I’ve tried to keep mine separate but it hasn’t worked too good ‘cuz when I do that, I kind of lose interest in it for some reason. Your pages here totally rock! Lovely pages, Hanna. -as always!! I like your mixed – up pages! I do both I suppose. I have a main art journal that is any and everything mixed up – they tend to be more finished pages. I have several others for different purposes. A couple just for watercolor sketches, one for collage and quotes, one for testing colors, handwriting and cleaning off stencils and stamps and such. Not really rules – it just seems that is how they all ended up. Your art journal is fabulous. I long for a book that just has ONE theme – ONE main thing, instead of a place where I am still trying out new things and it all looks mixed up – So I can see how you would want a book where it was just Your Own art and not other’s stuff that inspires you. (although I like THAT idea too. Love a junk journal!) I think you should totally go for it. I recently tried to start a new journal that had one main theme, but i already messed it up by trying out some new techniques that didn’t quite go well. I am glad that I can always buy or make new books. Maybe next time! I love all your mixed up journals, and I loved making them. I love plain sketchbooks too, though I haven’t made any for a long time. They serve different needs for me. Mixed media journals for me are about playing with colour, shapes and catching ideas/ thoughts/ feelings. Sketchbooks for me are about capturing memories, noticing the beauty and the details in the everyday. There is a place for both.